Cyprus is steeped in history and due to its geographical location, the island has been conquered and settled by many civilisations in the past. As a result of the island’s rich and chequered history, there are numerous historical sites, legacy of various civilisations; Persians, Hellenistic, Roman, Byzantine, Lusignans and the Crusaders, Venetians and the Ottomans. The picturesque countryside is covered in flowers in season. The forest clad mountains with their historic castles are ideal for the hiker. There are miles of undisturbed sandy beaches, with crystal clear waters. It is so easy to explore the countryside and the historic sites by car. North Cyprus has a good network of well surfaced roads. Just as it is in the UK, the driving is on the left. Nostalgia Hotel in Kyrenia is an ideal base for exploring the island by car, since the distances from Kyrenia to the various parts of the island can be covered in approx one hour. The picturesque harbour of Kyrenia is reputedly the prettiest in the eastern Mediterranean. Many cafes and restaurants line the historic horse shoe shaped harbour, where you can pass many hours sipping your favourite drink, watching the yachts sail in and out of the harbour. 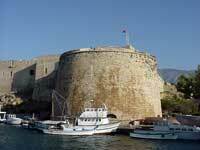 Kyrenia’s famous ancient castle guards and dominates the harbour. The world famous Shipwreck Museum is housed in the castle, where the oldest shipwreck raised from the sea bed is displayed. Famous Crusader Castle dating back to the 12th century, perched high up on the rocky mountain top overlooking Kyrenia. The medieval castle was used as a royal residence by the Lusignans, the crusaders, and in recent times St Hilarion was the inspiration behind the castle in Walt Disney’s Sleeping. The picturesque village of Bellapais nestles into the hillside behind Kyrenia. Made famous by Laurence Durrell in his Bitter Lemons. This historic village is dominated by its beautiful Gothic Abbey. During certain months in the summer classical concerts are held in its impressive refectory. Historic Famagusta's impressive walls were built by the Venetians and they are the best preserved walls in the Eastern Mediterranean. Its gothic cathedral of St Nicolas sits in the centre of the ancient town. The Citadel, Othello’s Tower, guards the entry to its harbour. Salamis is only few miles to the north of Famagusta, along the coastline. Salamis was the most important city kingdom in Cyprus during ancient times and its Roman ruins are extensive and impressive. The Roman Theatre, the largest in the Eastern Mediterranean, could, at one time, accommodate 15,000 spectators. The gymnasium and the Roman baths cover an extensive area. The sandy beaches extend the full length of the ancient city and in the spring the wild flowers and the giant fennel provide riots of colours. The Monastery is the resting place for St Barnabas, the apostle who spread Christianity to the island together with St Paul. The walls of the church are covered with icons and the cloisters are set out as an archaeological museum. The westerly drive along the coastline from Kyrenia is very picturesque, passing through the green forests. Guzelyurt, Morphou Bay, is the island’s citrus growing area and in winter and spring it is particularly beautiful with trees covered in oranges and other citrus fruit. Soli, the ancient Greek city with its basilica with extensive mosaics, and a Roman theatre. Vouni, 5th century BC ancient Persian Palace, perched on a hilltop with spectacular all round views. St Mamas Church at Guzelyurt, a historic charming church with beautiful carvings and icons. 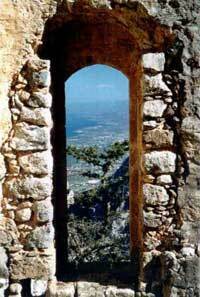 As well as St Hilarion, there are two more hilltop castles dating back to the crusader times. Highest of the crusader castles and the most challenging to the visitor. It was used as an imprisonment castle for the political prisoners during medieval times. Furthest east of the crusader castles, spectacularly located, commanding views all round and towards the Karpaz peninsular. In spring the whole hillside leading up to the castle is covered in a variety of wild flowers, most common being the wild cyclamen. 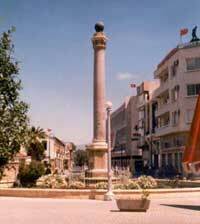 The ancient walled city of Nicosia is the only capital in the world that remains divided. The green line runs through its ancient heart. There are interesting narrow streets, museums, the historic gothic cathedral of St Sophia, a beautiful 16th century Ottoman Inn. The covered bazaar is colourful and fun to explore with Turkish delight, nuts and spices and many souvenirs on offer. The Karpaz Peninsular, called the Pan Handle, is a ragged and unspoiled part of Cyprus with many traditional villages, and sandy beaches where the turtles nest. The peninsular is dotted with ancient basilicas and ruined Byzantine churches. St Andrew Monastery, a pilgrimage destination, is located at the tip of the pan handle. 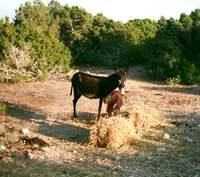 The famous wild donkeys of Karpaz have their special reserve on the peninsular. North Cyprus enjoys a typical Mediterranean climate. Long hot Summers, and mild Winters. The rainy season is in winter. The temperatures rarely drop to single figures. From February onwards the many varieties of wild flowers start blooming in succession and this colourful show continues well into April. Driving is on the left on the island. There is a good network of well surfaced roads. Exploring the picturesque countryside is an enjoyable and relaxing experience, with little traffic on the roads. The power is at 240 volts and 50 hertz, therefore you can safely use your appliances and the sockets will take tree pin plugs. However, some of the appliances in North Cyprus are of the two pin type, therefore an adapter may be needed. Although the water is safe to drink, it is advisable to keep to bottled water. When you are out and about you should always carry some water with you to avoid dehydration. The local currency is Turkish Lira. Sterling is accepted almost everywhere, but it is advisable that you have some local currency with you. All types of credit cards, Euro and dollars are widely accepted. There are cash dispensers along most high streets. Shopping is comprehensive and can be fun. Don’t expect to barter but you can ask for discounts. Clothing, made to measure tailoring, foot wear, sports wear, jewellery, opticians, leather handbags, Turkish delight and souvenirs are some of the goods on offer in the local shops. Most shops are open through out the day including lunch time and Saturdays. It is essential that you have a comprehensive Travel Insurance to cover your stay away from home. For Accidents and Emergency the hospitals may make a small nominal charge, depending on medication used. A fee is charged when a doctor is called or for visits made to the doctor. Medication is dispensed and paid for at the pharmacies. Visit to the dentist have to be paid for.